I've already made mention elsewhere about this being a "frigate in a bag" for MFZ: Intercept Orbit. Let's see how it stacks up. I picked this up for $3.99 from Toys'R'Us. Which gives us a Price per Piece of $0.09. Parts. Dark Green parts, Wedge Plates (wings) in two different shapes, 1x2 Modified Plates w/Bar (open ends), lampholders, new headlight bricks, Trans-Blue 1x1 Round Tiles, Hinge Plates, and the 2x2 Studless Slopes are all nice. Notice the ends on the Antenna pieces. They're almost flat, instead of rounded like normal. Here's the set as built to instructions on an IO Frigate Base. I think it looks pretty good and the overall length is just 11 studs. Here's the alternate build I came up with. I'm calling it the "Rhino". Stats: 2Rd+8/2B/2W. Phew. What a mouthful of a name. Bag. Purchased for $3.99 at Target. Price per Piece is $0.10. 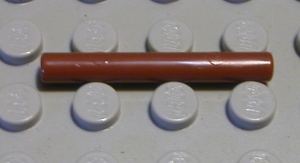 Instructions & Minifig. The head on the minifig would make a good old-school face for a frame. The weapon is an obvious choice. Parts. Levers and Bases, lampholders, large cheese slopes, a 1x2 Technic brick, and the 2x2 Modified Plate w/Hole are the things that catch my eye right away. This looks like an interesting set. Bag. I purchased it for $3.99 at Toys'R'Us. The Price per Piece is $0.09. Instructions & Minifig. I wonder what sort of parts I can trade the minifig for? Parts. I see four 1x2 Plates w/Bar (open end) right away. That's one of my favorite parts to build with. Two Barraki Eyes in white and three Bar w/ Claw also catch my eye. Just about the whole set catches my eye. This is a great parts set for me. I'll probably be getting several. Here's a quick IO Frigate design. Score: A (+15). It's a good parts set, at a good price. 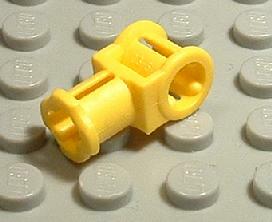 You might even be able to sell the minifig to get more parts. Toy'R'Us is running an in-store sale this week where you can get one of these free when you buy a Lego set. I can think of a few combinations that would be very workable. The old Lego Cuusoo project has ended its beta phase and been re-branded as Lego Ideas. MFZ and Cuusoo didn't always have the best relationship. That doesn't mean the community can't support ideas that would give us creations that would be of good use in MFZ. One of the mechs that I featured in my Non-Human 10 post has been put up for consideration. I think the Box Bot deserves our support. It's a fun idea and would make a great Lego set. Here are a few other projects that look good for MFZ as well. Mini Troopers. 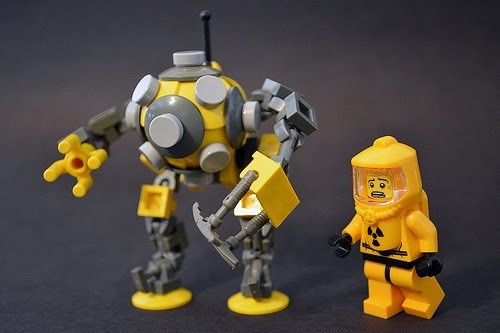 Yeah, these would fit in a MFZ game. First Responder D. These would make for some good scenery pieces. Steel Brothers - Steel Blade. This look slike something I'd design. 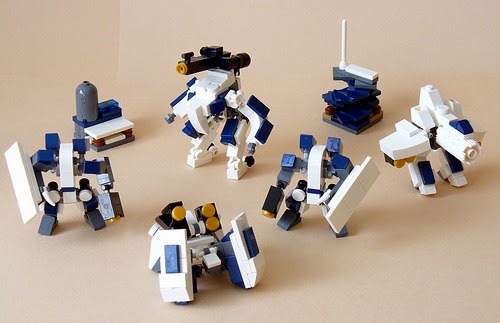 Micro Mechs - Pocket Models. 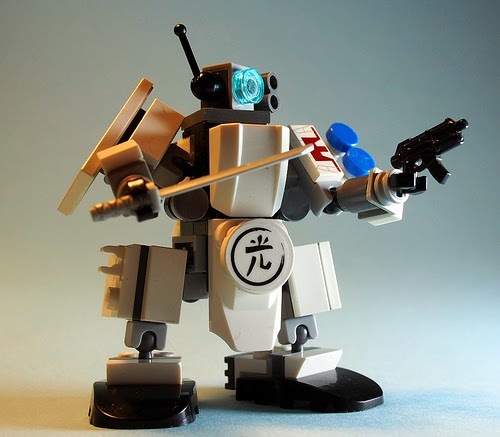 The idea behind this is great, collectible microscale mechs to trade and battle with in the schoolyard. MFZ writ small! I've supported all of these. I'll have to keep an eye open and see if there are any more we can throw our support behind. More mechs from a random trawl through Flickr. Minibot KSV-001 by Kosmas Santosa. I see 2Rd+8/2Ra/1B/2W for this build. F2-i1 by Legomania. Looks neat but, also looks a little fragile. YERA-Bot by M2com. The torso on this looks fantastic. The arms look really fragile though. "Taikeen" MFZ Squad by The Grandpappy. A whole squad of frames with a unified color scheme and matching Stations. Very nice. YY01 Yuki Yukan Cold Type by Rob J. Looks like a Chub variant with the new ball joints. Back in October of 2010 I started a topic over on the RPG.net Forums to discuss building Mecha/Frames for Mechaton/Mobile Frame Zero. Due to database limitations on that forum, topics have to be locked once they hit 1,000 posts or so. This is the first topic I created that has been locked due to size. Besides tooting my own horn, I'm mentioning it here because there's an interesting slice of history contained in the three years, seven months, and some odd days that the lifetime of that topic spans. There are also some cool designs from a lot of different people posted and discussed, along with some written and pictoral breakdowns of a couple different frame designs. I think there's some neat stuff there. You should check it out. Toys'R'Us has been running a Clearance event for a couple of months now. It appears to be an in-store only otherwise I would have just posted a link. Up until last week it was okay. Then they updated the discount amounts. Brown seems to be the predominant discount level for brick construction sets. Brown was 30% off but is now 50% off, which is a fairly steep discount. There are a few Lego items on Clearance but the majority seem to be Mega Bloks or Kre-O. 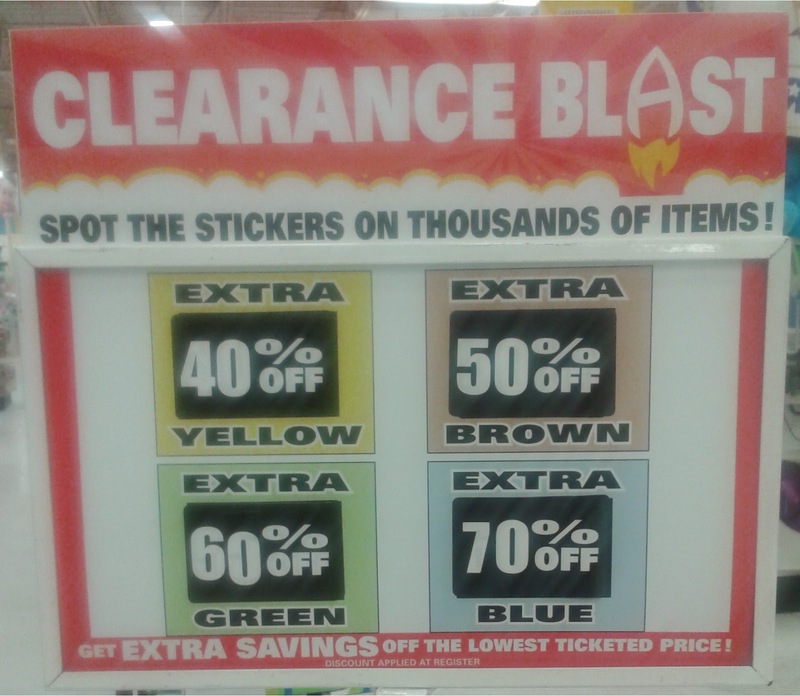 As always YMMV as to what is actually on clearance in your area, if you even have a TRU nearby. We've talked about this before. Now someone else has stepped up. Micheal Raichelson is accepting pre-orders for kits of five Chubs. For $50 USD you get three Direct Fire, one Artillery, and one Melee Chub, in a combination of one base color and one accent color. They're only available until June 14, 2014 so get in on this while you can. The Mobile Frame Hangar will be running its first contest in the month of June. 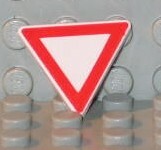 The person that posts the most battle reports in the month of June will win a small Pick-A-Brick cup of Travis Bricks. This contest starts on 12:01am, June 1, 2014 and ends Midnight, June 30, 2014. Here's a few pictures of the Travel Bag I use for MFZ. This is a Plano FTO Elite KVD signature tackle bag. Tends to run ~$70.00 at Walmart. I got mine for $35.00 or so on Clearance. These are the contents of the bag at the moment. Five dice bricks, two rule books, a camera, several rulers, six Soren style houses, two buildings of my own design, a few BURPS, five demo companies (3 boxed, 2 bagged), a bunch of Stations, a small tackle box (containing dice, Station flags, and other assorted items), and loose bricks for scenery/cover. All that and I still have left over space for more items. What's your Travel Kit like? Ced23Ric built a few trees recently. This made me dig my "plant kit" out of my demo bag and build a few of my own. Here's how I transport all the green, brown, and sometimes tan pieces I've assembled for this. These are what I built while watching television last night. I wouldn't call them perfect representations of plantlife by any stretch of the imagination, but they are interesting to look at. We constantly see broken sections of wall being used as cover and terrain in MFZ games. These can be a little bland and divorced from any story the gaming group might want to tell. Drawing inspiration from real world sources might help to make your table look better and give some sort of source for the game story. A friend of mine sent me this link to pictures of an Armenian ghost town. I figured I'd share it with you and see if might help inspire some people. While there are some broken down buildings, there is a context to these ruins and not just random wall sections. Moving on to something a little more urban, here's an article about abandoned malls. Some of the external locations could make good game backdrops. Also, depending on what scale you play at, you might be able to squeeze your mechs into some of the inside locations as well. I hope the pictures in these articles give you some ideas for new terrain for your gaming table. I picked this one up at Marshalls back around Christmas for $5.99. Box. MSRP is $11.99 for 80 pieces, which is a price per piece of $0.15. Not good. Parts 1. The corrugated 1x1 Round Bricks at the top center of the picture are pretty interesting. Two Clip Tiles! 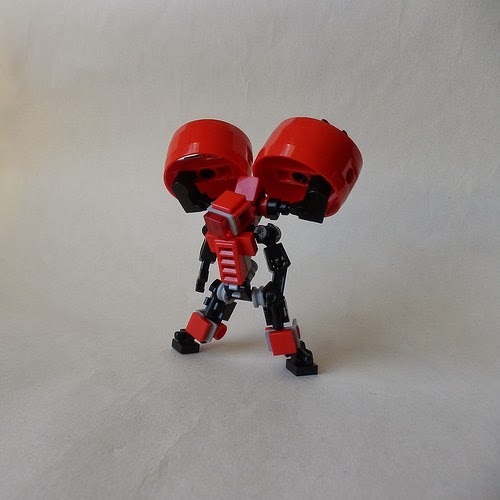 I've found those to be pretty rare in Kre-O sets. I like the color on that Trans-Purple piece, I'd like more of them. Parts 2. More rubber wheels. 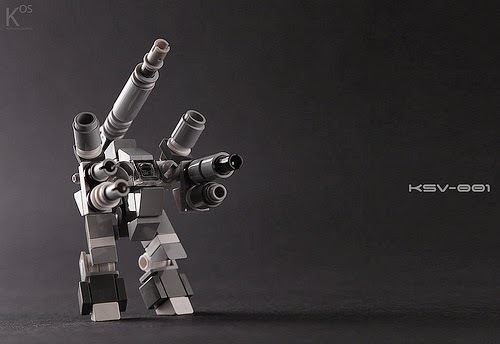 Looks like Kre-O has turned a corner there. I see a couple more Trans-Purple pieces. Those wheel arches would make for good shoulder pauldrons on a beefed up Chub. The 1x1x2 Brick is interesting. torso for the Autobot hero of the set. on the right arm. Which is something I find interesting. Score: B- (-5). Like the Cycle Chase set, this would make a good army builder for people who play at 4P scale. I stumbled across this one months ago in the tiny Clearance section of a local K-Mart. I've never seen another copy. Box. The construction on this one was a little thinner than the usual Kre-O boxes. More like a Lego box. MSRP is $11.99 for 119 pieces. Price per piece is $0.10. Parts 1. We have a bunch of Wedge Plates, some Cheese Slopes, some Grille Tiles, those funky Kre-O ball joints, some brackets, a couple studless slopes, and that weird head combo. Parts 2. Rubber tires! Hinge Plates of both varieties, a couple of those odd 2/3 Bricks, wheel hubs, axle plates, a two part steering wheel, new headlight bricks, and a couple of slopes. Parts 3. Bricks, plates, tiles, and a couple of 2x2 Slope w/Plate. This Flier is just one of the things I built using this set. I'm saving the rest for a Single Set Challenge post. Score: A (+15). It's a good set, at a good price. I had a lot of fun building with this set. With a slightly better price it could have had a perfect score. Transformers week? I think so. Box. 75 pieces for $11.99 MSRP. Which gives us a price per piece of $0.16. Ouch. Parts 1. The motorcycle cowl is going to sit in the parts box. The frame might be an interesting challenge though. The tile with the bar on top is interesting as well. This set has actual rubber tires. You can see the usual fiddly bits. Parts 2. Clip plates, cheese slopes, and jumpers, oh my. :-) That Trans-Purple piece is and open tube, no studs at all. There's also one of those rounded cones in black. Which is a nice change from the copper they're usually colored. 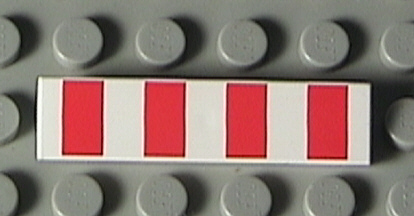 Kreons 1. Three Megatron-ish kreons with translucent weapons. Kreons 2. The Autobot hero. This one has an alternate translucent torso. Score: B- (-5). This would make a good army builder for people who play at 4P scale. I found it at Marshalls for $5.99 which is a $0.08 PpP. Once again inspired by a post on the MFZ G+ page. There are a number of parts used in the MFZ rulebook in the instruction section that aren't included in the "Garage Kit" parts list. I'll try to list them all here. 32062 Technic, Axle 2 Notched (x2) (Page 194, Suzerain) I know Soren used the 3704 non-notched version. But this version is more common at this point and easier to acquire.